When I visited Poland I made a point of visiting Mila 18. To some this means nothing but to us, Proud Jews who believe in fighting back, Mila 18 is a symbol. It is a symbol of heroism, as important as the Maccabees against the Greek Empire, the Jews of Masada against the Romans, David vs. Goliath. Warsaw Ghetto, Occupied Poland, 1943. Most of the 400,000 Jews of the Warsaw Ghetto have already been deported to Death Camps and murdered. Only 50,000 remain. The Nazis want to transport the remaining Jews to the Treblinka death camp. A few thousand Jews organize in resistance groups. The revolt began on April 19, 1943, Passover eve. Due to political differences the Jews formed two fighting organizations but they cooperated and coordinated their activities; the left wing Żydowska Organizacja Bojowa (ZOB) and the right wing Zydowski Zwiazek Wjoskowy (ZZW). Each had only a few hundred armed fighters, men and women fought side by side, heroically. These handful of starving Jews stood up to the evil Nazi empire and defeated it, day after day for three weeks. Jews could not believe it when they saw the brave Wehrmacht (German army) soldiers running away in fear, fleeing for their lives, from the Jewish ragtag army of ordinary men and women. When I visited Poland, I had to see Mila 18, I had to stand there, I simply had to, nothing was more important to me than that. One of the key leaders of the Warsaw Ghetto Revolt was a brave young Jewish man named Mordechai Anielewicz, leader of the Żydowska Organizacja Bojowa ZOB. The last stand of these Jewish fighters was the bunker on Mila street number 18. Anielewicz knew that there was no chance of victory, not even a chance of survival. But that was not his goal, as Elazar Ben Yair leader of Masada said, We can remind the Romans that some Jews still fight back. The goal was to fight back for the sake of dignity, not for the sake of victory. In this last letter Anielewicz writes. "The dream of my life has come true. Self-defense in the ghetto has become a reality. Jewish armed resistance and revenge are facts. I have been a witness to the magnificent, heroic fighting of Jewish men in battle." I was just watching a video about Jewish life in Europe before World War Two. 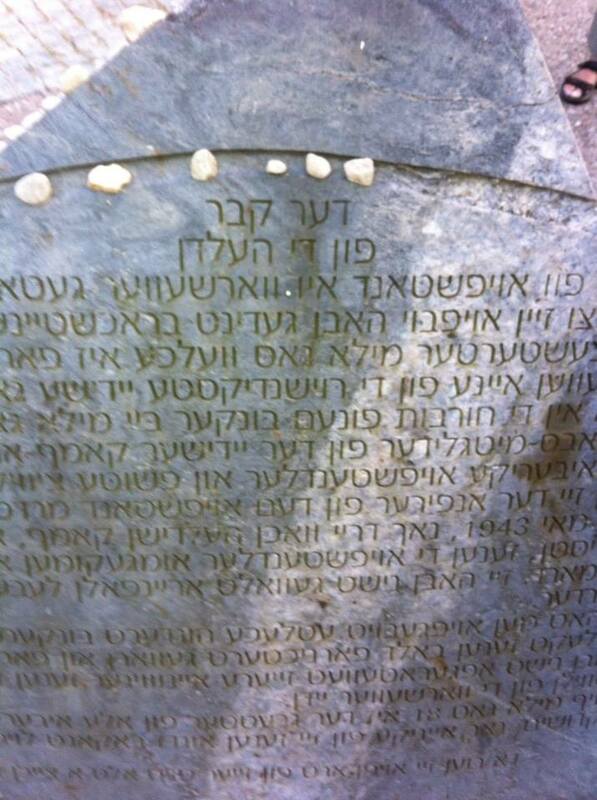 At every Holocaust memorial I find some version of my own name among the victims: Moshe Katz, Moise Katz, Mosche etc. In this video I hear of a Yitzhak Katz who lived in Lvov before the war and in the Kovno Ghetto during the war. He was murdered in a program in June 1941. I have a nephew with the same name, may the living be separated from the dead and may he live a long and happy life. I ponder the difference: One was murdered by a gang of Jew haters, unarmed and defenseless in a foreign land, while the other, my nephew, serves in reserves as a proud soldier, a paratrooper, in the Israeli army, and lives proudly in our own land. We are armed and prepared, we won't be fooled again. For us the goal is life with dignity, the right and the ability to fight back. Not every encounter will be a knockout victory but when we fight we stand tall. We have realized the dream of the Warsaw Ghetto fighters, armed resistance to tyranny has become a fact. Too many people in the free world have chosen not to be free. They have lost the battle before it has begun. They have the opportunity to train in self defense but they choose not to. They have the right to defend themselves but they choose not to. They have the rights that previous generations struggled for but they have squandered them. "The most difficult struggle of all is the one within ourselves. Let us not get accustomed and adjusted to these conditions. The one who adjusts ceases to discriminate between good and evil. He becomes a slave in body and soul. Whatever may happen to you, remember always: Don't adjust! Revolt against the reality!" Mordechai Anielewicz, April 1943. aged 22 years. Do not adjust to the reality of crime, resist it. Memorial in Yiddish at Mila 18, Warsaw, Poland. honoring the heroes who fought back, against all odds.